A profit diagram depicts profit/loss on the vertical axis and the price of the underline security on the horizontal axis. So, it estimates maximum profit/loss for different prices of the underline security at expiration. Maximum profits and losses in options depend on the strategy you have employed and the particular combination of options you have chosen. That being said, it is obvious that maximum profit/loss is different for the same option if you are long or short. Suppose we are long one call in stock C with strike price $28, expiration on March 2013 (250 days from now), premium $2.22 and the stock is now at $25.87. How much is the maximum loss or profit at expiration? By studying the above profit diagram we can see that on the vertical axis above zero are profits/share and below are losses/share for different prices of the underline security. On the horizontal axis we have the stock price. 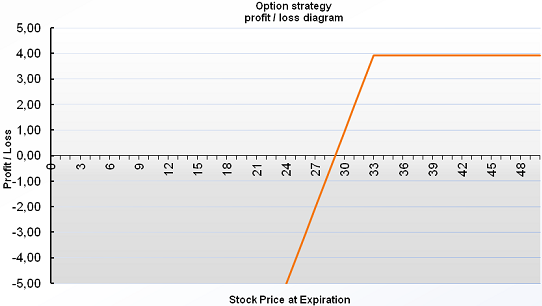 Line A denotes the maximum loss and in a long call strategy the losses are limited to the premium being paid ($2.22). So here we can see a down limit because line A cannot go below $2.22. Line B denotes maximum profit. We can see that it goes straight up as long as the stock price is advancing. So, potential profits on long calls have no upper limit. They are unlimited to the upside. Notice also that at point E we have the breakeven point of the strategy at $30.22, because the money we will earn from exercising it ($2.22) is equal to the money we have already paid to own it (premium). Suppose we are short on the same call option. How much is the maximum profit and loss at expiration? We can see that line A (above) denotes an upper limit in profits which equals to the money we have earned for selling the call ($2.22). This is our maximum profit potential. Line B denotes that there is no down limit to losses as long as the stock price keeps on advancing. So, the short call strategy has unlimited risk and limited profit equal to the premium we have earned. Point E is the breakeven point (at $30.22), because everything that we are losing if the call is exercised against us ($2.22) is counter weighted from the premium we’ve earned ($2.22). Suppose we are long in a put on ORCL with strike price $33, expiration on December 2012 (187 days from now), premium $3.93 and the stock price now is at $30.12. How much is the maximum profit or loss at expiration? 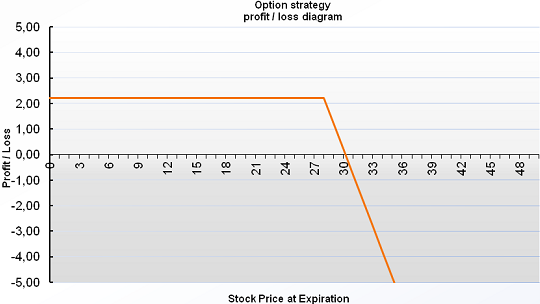 Line A denotes a down limit in losses which equals the premium we have paid ($3.93). Line B denotes that as long as the stock price keeps falling our profit gets bigger until the stock falls to 0, in which point we achieve the maximum profit (strike price-stock price-premium we paid=$29.07). Point E at $29.07 is the breakeven point because the money that we will earn if the stock price is there at expiration is equal to the premium we have paid ($3.93). 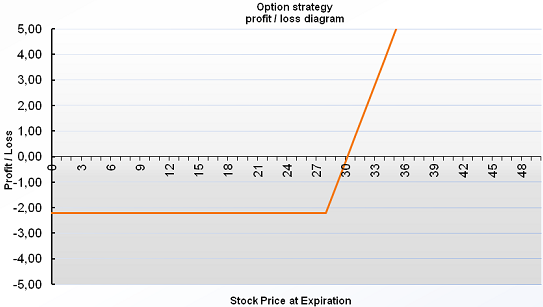 So, the long put strategy has limited risk and limited but quite high potential profit (until the stock goes to zero). Suppose we have shorted the above put. How much is the maximum loss or profit at expiration? Line A denotes an upper limit in profits which equals the premium we have earned ($3.93). Line B denotes that as long as the stock price keeps falling our loss gets bigger until the stock falls to 0, in which point we have the maximum loss (stock price-strike price+premium we earned=-$29.07). Point E at $29.07 is the breakeven point because if the stock price is there at expiration, the money that we will lose from the exercise of the put against us is equal to the premium we have earned ($3.93). 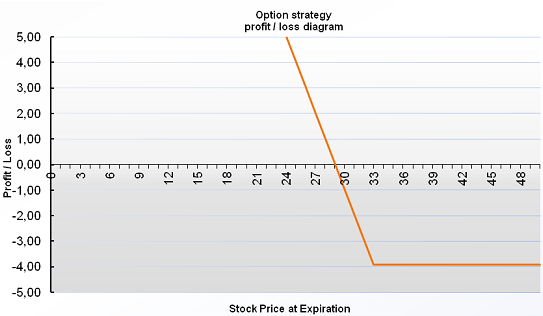 So, the short put strategy has limited profit potential which equals to the premium we have earned and limited but quite high potential loss (until the stock goes to zero).